In a year where someone had to surprise in the Atlantic 10, it seems 3 teams are doing just that: Richmond, Duquesne, and Saint Louis all have a shot at getting a double-bye in Washington D.C. Now, if I had to put my money on it, I think Davidson, St. Bonaventure, and VCU will end up getting the top 4 spots. However, given the volatility of this year’s league standings, I don’t know what to think anymore. Here’s a case for each of these underdogs finishing the season strong and getting to play on Friday in the 2018 A-10 Tournament. Of the three aforementioned teams, Richmond has the best record, and thereby, it’s technically in the best position to finish top 4. However, the Spiders have a brutal stretch to come, and if they don’t sneak away with at least 1 or 2 wins, they’ll be out of contention. It starts with beating VCU at home. It might not sound so difficult, considering UR went into the Siegel Center and stunned the Rams, but VCU has picked itself up and is looking like an improved team. Not to mention, Richmond hasn’t won in the Siegel Center since 2015. Should the Spiders survive the Rams at home, road games against St. Bonaventure and Rhode Island await; that’s a brutal 2-game stretch. Let’s say the Spiders escape those 3 games at 1-2; the rest of their schedule isn’t so bad, but it features 2 road games (GW and GMU) and a home contest against a red-hot Saint Louis team. The Spiders have surprised, but I’m wondering if a tough finish to conference play derails them slightly and kicks them down to the 6 or 7 spot heading into Washington D.C. I’m not going to discount their chances, but 50-50 games (like VCU and Saint Louis) definitely have to go the way of UR. Duquesne has let a few major opportunities slip away as of late, but it’s still in fighting contention to secure a double-bye in D.C. Had the Dukes outlasted Richmond and St. Bonaventure at home, I’d think them to be almost a lock. Unfortunately for Dambrot’s group, that wasn’t the case, and now, the Dukes will have to pull some magic if they want to finish top 4 in the Atlantic 10 this year. The Dukes have road games against Dayton, Saint Joseph’s, and St. Bonaventure remaining. Those first 2 are winnable, but the last one is probably a shot in the dark. Not to mention, a home game against a surging Davidson team could very well go down as a loss: that’s a game Duquesne needs to win. 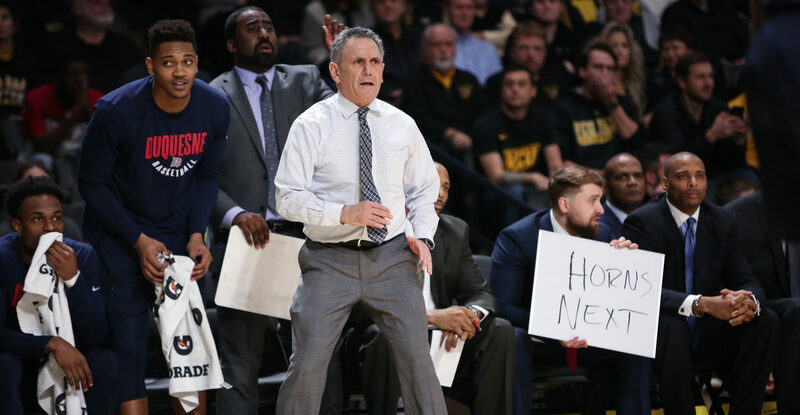 The road has been unfriendly to Duquesne in conference season (at least when you look at the W/L column), but that could change down the stretch. If Duquesne wins at Dayton, Saint Joseph’s, and Massachusetts, I believe they’ll have a shot. At 6-5, it may sound strange to think of the Billikens as an “on-the-rise” team, but boy has Travis Ford been turning things around lately. SLU fans probably find it hard to forget a trouncing at La Salle to open up the Atlantic 10 season, and things wouldn’t get any better as Saint Louis stumbled out to a 1-4 A-10 record. However, the Billikens have since won 5 of their last 6 with their only loss coming by 1 at home to VCU. Saint Louis has been a very strong home team this year, and La Salle and George Washington will certainly be beatable in Chaifetz Arena. SLU has good road opportunities as well, facing beatable teams like Dayton, Duquesne and Richmond, but 2 remaining games against St. Bonaventure won’t be easy. I like the way this team has been trending, and if Ford could pull off a top 4 finish in the A-10 this year, it’d be miraculous. Again, if I had a guess, I think the URI-Davidson-St. Bonaventure-VCU seeding will hold, but I like the chances of one of these 3 teams shocking the league and making a late season run. Because of how hot they’ve been, and because I think they have the easiest remaining schedule, I’m going to say Saint Louis has the best chance at this moment. Momentum is on the side of the Billikens, but we’ll see how things play out in the coming weeks.